Today Harar is the smallest state in the Federal Democratic Republic of Ethipia, located in the south eastern about 526 km from Addis Ababa. Harar was established by Sultan Abu Beker Mohammed in 1520. Harar, the Holy City of Ethiopia's Muslim community, is believed to be the forth-holiest city after Mecca, Medina and Jerusalem. The old City Wall of Harar is the main attraction and symbol of Islamic architecture. Harar has approximately 90 mosques, which form the largest concentration of mosques in the world. One of Harar's main attractions is the hyena man who feeds hyenas on the outskirts of the town every night. Harar is known for its turmoil and bloodshed. Ahmed Gragn killed Abu Beker Mohammed who was the ruler of Harar. Ahmed Gragn was a militant Muslim leader and used Harar as his base to launch hisjihad and raids against the Ethiopian Christian Empire in 1528. He destroyed many churches and threatened the complete distruction of Ethiopian Christendom. He was killed by Emperor Gelawdewos in a Battle near Lake Tana in 1543. The raids continued against the Christians led by Ahmed Gragn's widow Bati Del Wambara. In 1559, Emperor Gelawdewos marched on Harar with the aim to eradicate the constant religious sectarianism taking place. Gelawdewos was killed in a battle and his head was paraded around the city on a stake. In 1647, Emir Ali ibn Daud took control the city and established an autonomous administration. Despite the continuous fighting with Oromo tribes, Harar expanded; it became well populated, an important city for trade and a centre of Muslim scholarship. It issued its own currency. After 250 years of autonomous rule, Egypt occupied Harar and killed the Emir in 1875. The Egyptian action created a strong resistance in the Muslim community of Harar. Emir Abdullah took control and led a campaign against the Egyptians, which ended in 1885. 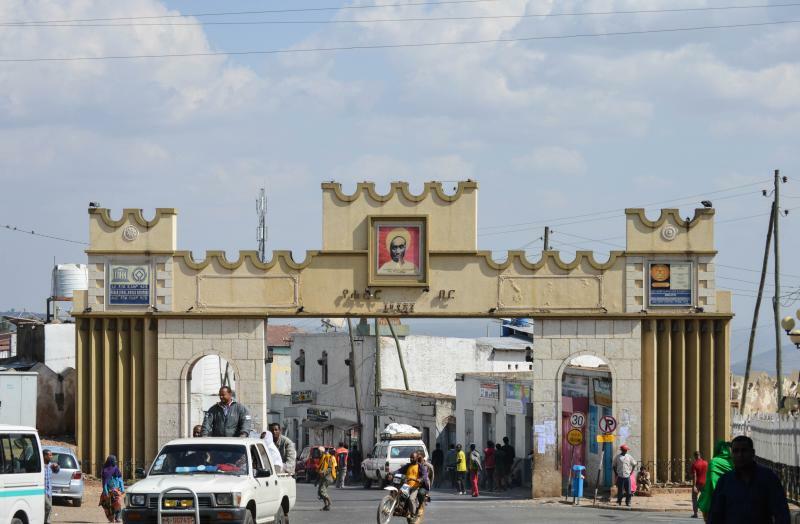 In 1887, Harar lost its autonomy when Menelik, Prince of Shewa, who later became Emperor of Ethiopia in 1889, waged war against the army of Emir Abdullah. Menelik defeated the Emir at the Battle of Chelenko in 1887. Menelik then established a new administration, including several members of the emir's family to prevent renewed religious sectarianism, headed by Ras Mekonnen, the father of Emperor Haile Selassie. Harar then began to disintegrate and lost its status as a trade centre in the end of nineteenth century when the railway line was built between Addis Ababa and Djibouti through Dire Dawa. From 1902, Dire Dawa became the main commercial centre of Ethiopia. However, Harar remained as the spiritual City of Ethiopia's Muslim community, the political capital of Hararge Province until 1994 and has become a federal city-state since 1995. The ancient metropolis of a once mighty race, the only permanent settlement in Eastern Africa, the reported seat of Muslim learning, a walled city of stone houses, possessing its independent chief, its peculiar population, its unknown language and its own coinage; the emporium of the coffee trade and the head-quarters of the slave trade and the great manufacture of cotton cloths, amply it appeareddeserved the trouble of exploration. Before the recent rise of Addis Ababa and Nairobi was the only city worth of the title in east Africa between the Ethiopia city of Gondar, to the north of Lake Tana, and the Arab city of Zanibar, on the island off the east Africa coast. ETHIOPIA, the cradle of mankind, one of the crossroads of civilization, and a mosaic of nationalities, has much to offer to the world heritage. It has already registered six centers in the UNESCO World heritage list. This prehistoric and natural sites are comparable with some of the moat famous world monuments. Hadar, the birth place of Lucy. Lalibela, and the archaeological site of Tiya are some of the wonders of Ethiopia. There are still more place to be considered for the World Heritage list; Harar located in south Eastern Ethiopia about 526 kms from Addis Ababa, should be one of them. It doesn't matter you go there when the coffee bushes are in flower andthe air is heavy with their strong bitter scent, or when the ripe fruit of theOrange trees glow in the sunlight, it is always lovely in Harar; there is always something blooming, always being harvested. At least seven settlements are mentioned as the precursors of Harar according to a popular legend. These were esshkanti gai (gai means "city" or "settlement"). Fereka gai, harawe gai. Hassen gai; Ruhuk gai; Sammti gai; and Tuhkungai. All this sites are now awaititng archaeological excavation to tell their stories, except Hasseb gai wich still keeps the name north Harar. These settlement resolved their enmity and agreed to establish their center in Harar. This center had fertile soil with abundant water to establish a sustainable agriculture system: it was also a healthier location, being free from the common tropical diseases, such as malaria, which are rampant in surrounding lowland. There are many legends related to the foundation of the city. However, shakih Abadir, " the patron Saint" comes first when the name of Harar is mentioned. He is said comes with his entourage in the tenth century from Arabia. It is belived that he was the one who organised the administrative system of the city and also gave Harar its name. With its numerous mosques and shrines, Harar is considered the "fourth holy city of Islam" after Mecca, Mediana and Jerusalem.Perched on a gentle hill, drained by network of rivres, Harar is an ancient walled city. It was founded a millennium ago, between the seventh and ninth AD, by a Semitic- speaking people. The agricultural system of Harar was effective and efficient. Using terracing and irrigation as well as intercropping which is useful for tropical soil and a symbolically correct practice, the harar farmers were able to produce grain and cash crops in adequate supplies for local consumption and export. It is also considered as the original cultivation center of the world famous coffee arabica and the mild stimulant leaf called (cath edulis). Both are lucrative export items, which provide the Ethiopian economy with substantial financial resources. Harar was not dependent exclusively on agriculture, but also benefited from carvan trade, since it was geographically a half way house of extensive trade between the Red Sea, the Indian Ocean littoral and the vast Ethiopian hinterland .To facilitate the international trade of those days, Harar had to mint its own coinage. In the whole of Ethiopian Region, it was the second center after Axum to produce coins since at least the Middle Age on. Harar also played a role bridge between the old Axumite coins and the modern ones since the first coins of Menlik were struck in Harar. This broad and stable economic base helped Harar to become one of the leading center of learning in the horn of Africa and to develop a unique urban culture uninterrupted through the centuries. The shift of the capital city of the Adal State from Deker, an old settlement, to the city of Harar in 1520 brought about the heyday of Harar. The new capital become the springboard for Imam Ahmed Gragn, to incorporate to the Horn of Africa. However, the leading role of Harar did not last long. 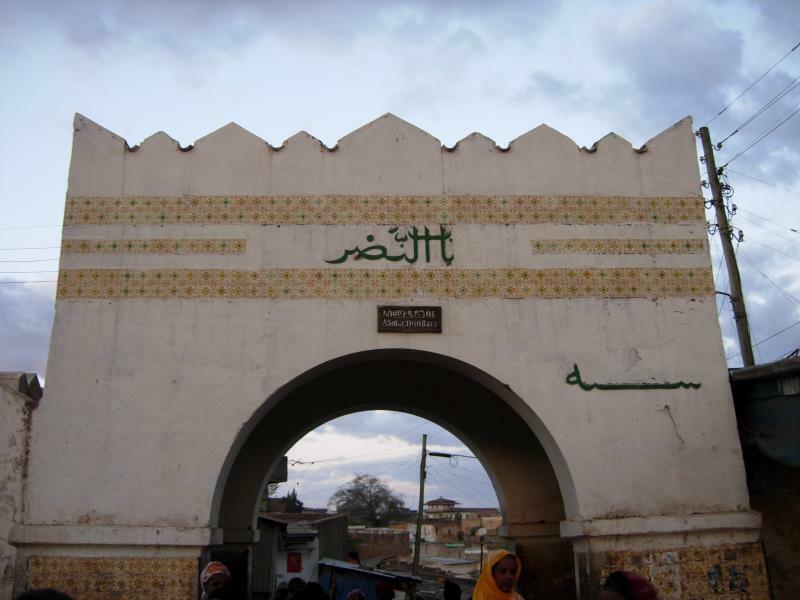 After the wars of Gragn, Harar was exposed to frequent attack from different sides.Nur, the nephew of Imam Ahmed Gragn, built the remarkable defensive wall popularly known as jugal. This wall warmly engulf the city which is confined within 48 hectares and 362 narrow lanes. The circumference of the wall 3,348 meters; with five traditional gates. These five gates demarcate the administrative as well as the socio-zones of the old city. Jugal gives a sense of direction and belonging to harar. This wall, therefore, defines the major cultural texture of holistic fabric of the harar. Without it, the native feels as if the link with social and cultural environment is missing. The social system is governed by gai a da the culture of Harar communicatedthrough a unique language which is a mixture of Cushtic and Semitic languagesknown as gai sinan, the language of the city. The hala mahal etiquette, of the city is a binding force to enhance urban culture. After its heyday as the center of the mighty Adal state, Harar gradually declined and become a small city- state ruled by the dawoodi dynasty from 1647 to 1875. The occupying force of Egypt interrupted the rule of the dynasty between 1875-1885. The closed gates to European travellers were wide open during the Egyptians occupation. Rhmbaud, Paulischke (1888) and many other came to Harar. The last Amir, Abudullahi, took over the mantle power for less than 2 years, but was defeated by Menelik at the Battle of Chelenqo in 1887. Addis Ababa, the present capital of Ethiopia, which was established at the time of the Battle of Chelenqo, benefited from Harar experiecne. Surveyors, masons, bookkeeper, peace keepers called yaradda zebegn, tailors and similar professionals who were beckoned to Addis Ababa, contributed and disseminated their skills in the building of the national preparation of the famous Battle of Adawa of 1896. Just before the coming of the Italian Fascist invasion and occupation of the 193, two journalist, Waugh and Frago visited Harar. Both of them were impressed with cultural life of the city. Cerulli [1936 and 1971] who was first class Italian scholar of Semitic studies joined the invading army and administered Harar for sometimes. His books are still the best reference work on the history of city. As the result of the invasion, Harar expanded greatly and is now quite often referred to as "the great harar." The Italian destroyed the northern farmland and established their administration headquarters called Butega without affecting the old walled city. Within a walking distance one can easily transcend space and time to pass from a medieval pre-industrail realty to modern city. The old city, with its traditional rectangular stone house, winding narrow lanes, abundance of mosques and shrines as land marks, perpetually enchants its visitors as well as its residents; in contrast, the modern quarter is characterized by wide asphalt roads and concrete buildings. Currently, Harar is one of the nine national of states of Federal State, encompasses about 400 sq. Km. With a population of more than 120, 000 is ready to encounter the twenty first-century with self assured strides to fulfill its responsibility of integrated development in all sphere of life. The age old metropolitan Harar has already achieved impressive results in various fields of activities. This old city which claims more than a millennium of history is happy to share its mystic knowledge and is ready to learn from others. Moving from a macro to micro view of the city reveals an abundance of aesthetic traditions that echo this beauty. Many compound had courtyard with green plants, pots, benches and that sense of peace and order in a small space which is so often characteristic of traditional Islamic life according to the observation of Henz. The Harari house reveals a sense of proportion and mastery of building technology, perfected over the centuries, that is both warm and inviting. Inside the house, on the walls of the living room, one is overwhelmed by the balance and color composition of the display of baskets. The colorful dress of Harari women is anther dimension of the aesthetic beauty that permeates Harari life. Indeed, Harar the jewel of east, has earned many names; Abadir,' Medinet al Awlia's, Jebel al Awlias', the fourth Muslim City', The Timbukutu of the East" and many others. Still, it radiates as a historical, cultural as well as social peg which should be reserved for posterity without affecting new innovative trends. The maze narrow lanes and the unforgettable colorfull market scenes, added to the uniquely structured houses, give the city the touch of a living museum. The recent conservation attempt is encouraging, but it is not enough. In conclusion, this is a glimpse of the beauty of the walled city. A mountain top view of Harar reveals a mosaic of diverse scenery. One sees great natural beauty in contrast to the beauty of the human built environment. The colours are remarkable. Outside the city walls the lush green foliage with meandering steams reminds one of Persian carpets. The prolific writer on Ethiopian affairs, Henze, compare this beauty with an illustration of medieval manuscript. In contrast, inside the old wall the colors and shapes change, one sees primarily whites and grays and diverse ranging of geometric shapes of varying sizes. The hill on which the old city resists is a constantly changing organic form, shaped and reshaped by the hands of masons for over a millennium. The house, mosques, the two churches, the market places and the narrow streets from this magnificent work of art. In 1855 AD the British explorer Richard Burton became the first European to enter the City of Harar and in his letter of justification for embarking on a venture perceived to be fraught with unknown dangers he describes Harar as the entre-pot between the Red Sea and Indian Ocean coasts and the massive Ethiopian hinterland as:- The ancient metropolis of a once mighty race, the only permanent settlement in Easten Africa, the reported seat of Muslim learning, a walled city of stone houses possessing its independent chief, its peculiar population, its unknown language, and its own coinage and the great manufacture of cotton cloths, amply it appeared, deserved the trouble of exploration. In the 140 years since then Harar had gone through innumerable vicissitudes including four major wars, a series of socio-economic upheavals and natural catastrophes. And yet it has maintained its dignity. Its unique culture and a particular brand of serenity. Harar today is a city whose people thrive on smiles and friendliness. And unlike Burtons days. It can be easily and most comfortably reached along an asphalt high way from Dire Dawa. Which is only 55 kms away and by all weather road from Jijiga. In historical retrospect, Harar began to come into geo-political prominence with the founding of the first Muslim Sultanate in 896 AD. It flourished through the centuries and served as a powerful economic and commercial capital of a vast Muslim State, which vied on equal terms with the Atse state in North West Ethiopia. It further became the administrative capital of the Region in 1521 AD. The great defensive wall called the Jugal, that surrounds the inner citadel of harar was built in the 1550s by Amir Nur, the nephew of the great Imam Ahmad ibn Ibrahim al Ghazi, commonly known as AHMED GRAGN Harar is located in South Eastern Ethiopia at about 526 kms from Addis Ababa. It is situated between 9018. North latitude and 4207. East longitude. It is bordered to the north by Combolcha and jarso, to the South by Fadis, to the East by Babile and to the West by Alemaya. It is situated on the plateau between 1600 ms and 1900 ms above sea level. Aw Hakim is the major mountain near the city. The main rivers are the Hamaressa, Erer and Bissidimo further more numerous rivers in the area flow South to drain in the Wabi Shaballe basin. In fact the Jugal itself is surrounded by streams which spring intermittently in their very short course from the five gates. Climatically, Harar is among the luckiest cities in the world which are mild throughout the year. To quote Richard Burton again it is warm but not hot. Cool but not cold. The rainy season lasts from June to September. The annual average rainfall varies between 700-800 mm. And the temperature between 12.60C and 260C. Agriculture is the main economic activity. The cash crops include the finest coffee, the high grade hides and skins, ground nuts, fruits and chat (cata adulis). As it has been stated earlier, Harar, the ancient metropolis of Eastern Ethiopia became a fully developed city state almost 1000 years ago _ _ just at the beginning of the second millennium A.D. The Jugal or the defensive wall surrounding the inner city, was erected by Amir Nur early in the 16th century, as a bastion against the marauding hordes, propelled by the massive south/north cushitic migrations and the subsequent upheavals, which through the course of three-score years redesigned the ethno-cultural and socio-economic configuration of Ethiopia. In the more recent past, the imperialist conflicts in Europe, which instigated inter alia the Scramble for Africa further fragmented Eastern Ethiopia and drastically circumscribed the role of Harar as a major entrepot, or half-way house between the Ethiopian hinterland and the Red sea/Indian ocean littorals and waterways. However, with the completion of the Ethio-Djibouti railway in the first quarter of the current century, Harar could maintain a classic geographic inertia to benefit economically from Ethiopias expanding foreign trade through the period of the Italian occupation till the end of world war II. In fact, at the conclusion of the Ethio-Italian War in 1941, the province of Hararghe which consisted of an integrated Land mass divided from the major Ethiopian massif, and cut off to the East, by the Great Rift Valley. However, by the early 1960s, Arussi and Bale were whittled away by the Haile Sellassie regime to from runaway mini-provinces. And in 1988, the Derg further carved the already impaired Hararghe Province into two Administrative and two the so-called Autonomous regions. And finally, in 1992, the Transitional Government of Ethiopia (TGE), as part of a fundamental restructuring of the Ethiopian state on democratic bases, has delimited Harar and its surrounding sub-districts into, Region XIII, consisting territorially of the inner city of Harar and its concentric rural rings within an approximate radius of 10 to 15 kms to form the democratically elective and autonomous Region. After formation of Federal Democratic Republic of Ethiopia, Harari People National Regional State became one of the nine Regional States of Ethiopia. Settlements in the region are believed to have existed some 1200 years back and the tribe is identified as Punt tribe, from which the Hararis are believed to have emerged. Different settlement site are postulated around Harar, such as Dakar, Malka, before the establishment of the walled city of Harar some 10 centuries ago. Though Harar town is refereed to as a medieval town, (after the construction of the wall) the city was established some 1000 years back. A simple proof is the age of the "Jumma Meskid"1 of Harar town which is over 800 years old or perhaps more and believed to have been built during the reign of Awe Abadir. The fact that such a huge mosque was built, indicates that there was demand for it i.e. it was needed to accommodate the people already living in the town. The size of the mosque indicates the existence of the town long before the construction of the Jumma Mosque for Friday prayer, as the rule of Islam, such a mosque is not required for people living in scattered settlement. Hence, from this facts, it is not difficult to conclude that Harfar town existed before 1000 years, before the expansion and growth of Harar to became the capital of the then national government. According to some legend, there is a saying of the "Sati Geyach"2 which is an indication that there were similar settlements around Harar before Harar attained the status of a center of political decision, center of learning, and commerce with a link to the trade route between the Zeyla port to the west and south of Harar as far as the Bale region. Jumma Meskid -the grand & the oldest Mosque for a Friday congregation pray. Sasti Geyach- the former seven settlements prior to the walled city. The ancient government in Harar is known to have ruled and administered a far great or geographical region than the present one. The extent of the Harar state include the eastern highlands and lowlands region up to port Zayla. The government, like modern governments, had its own state machinery, political system, social system, financial and economic systems. Haring a government, are the necessary institutional frame-work enhance economic and social growth and brings about a multifaceted development of the region. It seems that the trade boom and the ability to create one of the worlds ancient market centers can be attributed to nothing else other than having a free market economy. The Harari people established their political dynasty in Harar. In the history of Harar about seventy two Amirs (Kings) were regretted. The first Amir was called Amir Haboba Ibn Harar (969-1000AD). The administrative system of the Amirs was tribal federation among the people of Harar, Somali, Afar and Argoba. Among the Amir mentioned above, Ahmed Ibn Ibrahim, better known as "Ahmed Gragn" or "Ahmed the left-handed was the famous Amir and during his reign Harari government had strong military force which could defend its interests. Due to conflict over trade route, Ahmed Gragn launched a large scale military campaign against Lebne dingil (1523-1540) of the central Christian kingdom and the first considerable victory was achieved at the battle of shumburm cure in 1527. Achieving victory after victory, Ahmed Gragn conquered and could control about three-fourth of Ethiopia until he was defeated by king Geladewos with the help of portugess military forces. The other famous ruler and among best remembered Amirs of Harar was Ahmed Gragn's nephew called Amir Nur Ibn Alwazir Mujahid who came to marry his uncle's widow in a plan to revenge against king Galawdewos. Achieving his goal, Amir Nur defeated and beheaded king Galawdewos at the battle his head to display in Harar. Then commediatly, Amir Nur became king of Harar. Amir Nur Ibn Alwazir was destined to become one of Harar's best remembered rulers. He was responsible for the construction of the great wall around the city of Harar in 1551-1552. This defensive wall, commonly known as jugal was 3342 meters in circumference, an average of twelve feet high and three feet thick. The wall had five gates and was supported by about 24 oval shaped watching towers each of the five gate was used by farmers, merchants and caravans traveling from different directions. At the beginning of the third quartos of the 19thcentury the situation of Harar changed. Port zayla including Tejuran and Berbara were seized by Egyptian force. The Egyptian rule under Rauf pasha initiated Harar in a rapid modernization process for about a decade. However with the influence of British colonial rule, Rauf pasha was forced to withdraw his troops from Harar on January 19th, 1885. Power was then smothly transfered to the document of the previous Amir, i.e. Amir Abdulahi Ibh Mohammed (1885-1887). The economic base of the Harar government, in addition to agriculture, were trade, cottage Industry and taxation. Different kinds of raw materials were exported and manufactured goods. Jewelry, etc. were imported. To deal with domestic as well as foreign trades, The Harar government used to mint its own coins in the medieval period known as "Mahalak". More than twenty different coins were minted by respective Amirs. Therefore, in the history of Ethiopia, Harari coins were the first coins next to Axumite ones. The development of man made resources, farmlands, cottage industries, handicrafts and literature can be counted the establishment of Harar town. Other factors that possibly existed were an appropriate land tenure system which allowed private ownership of land coupled with public ownership vested in agents like the Awach (shrine center with democratically elected directors) and the waqfi administration system. Some of this center are still in existence through out the rural areas, but have lost control of public resources. To mention a few Awe Umar, Awe sofi Yahya, Awe Barkadle, etc. were agents for the management of public lands. The state is also known to have manumicipal and other offices administration mechanisms for both urban and rural areas to manage agricultural land and water resources by Social organization which was lead by elected and approved leader among the farm communities. Currently available manuscripts and documents show that every house and farm was identified and managed by means of recorded plans (with drawings) and ownership certificates and licenses. No single house was built in the town illegally without the permission of the municipal or town governments. Every public property and properties belonging to orphans, mosque or the municipality were centrally registered by Quads who act as secretariats for the Amirs. The architectural and engineering knowledge is manifested in the establishment of Harar town itself. Its living houses and monuments, Mosques and shrines: that were in use for a 1000 years are clear proof of the cultural development of the people and their achievements. Currently about 6000 historical houses 96 mosques and 150 shrines are registered. The ancient Harari developed their land for farming, tamed animals and plants. Their ability to feed themselves and their off-springs for centuries on small plots of farm which can still be observed today after surviving all the historically known natural calamities and disasters is obvious. Protecting their land from degradation and loose of soil fertility they have passed over their developed resource along with the necessary knowledge and skill they possessed from generation to generation (for over thousand years) until the present. However, this land is, today though it is suffering from degradation. We can learn lessons from the methods they used to feed themselves and satisfy their needs through the proper and sustainable use and development of their natural resources. It can be seen that the human resources too, were used sustainable. Otherwise Harari's would have ceased to exist a long time ago. The ability to prepare fertilizers (manure) and use them properly and correctly is one factor to keep soil fertility to boost production. The awareness and ability to use the flood water to keep their land fertility and irrigate their fields. The knowledge and ability of irrigation technology through construction of small earth dams across all streams and rivers and the construction of irrigation canal along the hilly sides and uneven and rough landscape. The practice of crop rotation. Realization of the benefit of mixed farming that enables on to maintain the ecological balance and helps the effective utilization of a plot of land. The know-how of genetic engineering, (though in its crude form) for hybridization of fruit plants (for example grafting method). Effectively protecting soil erosion by means of terracing and tree contour planting. The ability to identify plants which support each other and planting them side by side (e.g. coffee and kugnee). The knowledge and ability to select various seed, crops for different localities. The ability to use "Tini" (Cactus) leaves and stems to use its rich water content by burying it near and around important plant debian-sys-maint zones (especially coffee) during draught or when water shortage is encountered. There is traditional believe that advocates planting fruit trees for use by next generations as a righteous deed. They also replace aged coffee and chat plants with new ones as a custom for each birth of an offspring. These traditional teachings prohibit the cutting or destroying of plants and trees and promote the fair treatment for animals etc. helped the conservation of such resources. The above techniques have been practiced as recently as half a century ago and in fact were witnessed during the life time of this generation. These techniques are mostly useful even today and it is only by such system of farming that the present generation can be able to maintain its inherited agricultural resources in tended with these of modern fertilizer and extensive survives. The need for modern technology and machinery- will be inevitable. However, the above farming techniques alone havent furnished all the agricultural requirements. Harars supported their farming with their own produces of all needed agricultural implements and tools in their town cottage industries. The industrial resources grew until the invasion by feudal rule and the traces of the industries, (though degraded and strangled) are steel active to day. Hararis have produced agricultural implements appropriate to (some are unique) their land feature and farm type. The implements are either made woods or metal. They produced such tools as hakafa(shevel), makhra(hoe), kalka(ox), mancha (traditional tools resembling sickle) used for different purposes) from steel and Nuguy, gamaro etc. from wood (waiza). Though they had full knowledge of heat treatment of metals and forging, it is not known whether they produced steel. There is evidence that they imported copper and some metal through foreign trade. But production of some metals or alloys were done locally as some evidence indicates. Whichever way it was done, it is clear that they facilitated their farming by being self sufficient in agriculture implements. The fact or that has made Harar town grow as a center of trade is the existence of town products from urban cottage industries along with farm products. To satisfy their clothing needs they grew cotton in their farm fields and produced yarn and cloth using their own wooden machinery. Historical records witness that Hararis have exported textiles like silk. The existence of silk fabrics is a recent memory for the present elderly generation. This sector of the textile industry survived till the 18th century. An European traveler who has visited Harar about half a century before the invasion of Harar, witnessed that Harar produced textiles of high quality superior in fabric and beauty than the ones produced in European industries. The achievements of the Harari dealt with above would not have been possible with only localized trade. The existence of a natural harbor access to the other world or environment) is considered as a necessary natural resource. In the case of the Hararis, there existed such a harbor on the red sea cast east of Harar (now in Somalia) known as Zeyla, which has enabled the Harari people to trade with other nations and civilizations. Economic growth and progress in civilization is unthinkable without commerce and foreign trade. It is through external trade that people can really satisfy all their needs and exchange ideas, knowledge, skills and means for further development and better living conditions of the people. So the existence of such trade link enabled Hararis not only to exchange their commodities, but also to learn and import the latest techniques, scientific discoveries and technological achievements that the world could offer as far as it was found useful and not harming their cultural values. So it is obvious that, most likely, in this form of foreign trade, they were able to satisfy their needs and develop their agricultural and industrial techniques to develop and use sustainable their natural resources. Such trade links are historically known to have existed with the ancient Egyptian civilization, the commercial center of Mecca in Saudi Arabia and with the Far cast civilization as far as China and India. The growth and development of the Harari region became stagnant and decline as a result of the colonization of the red sea coast by the expansion of colonialist powers in the horn of Africa. This deprived the people to have access to the port and the situation was further aggravated after the invasion of Harar by the feudal lords which led to the decline and degradation of all resources of Harari region. The deliberate act of the then centralist tyrant government to isolate the Harari region from the external world by complete blockage of the region even with nonbearing mutually supporting peoples has contributed to the degradation. It is an accepted principle, that when people lack access to their natural resources the result will be in poverty, stagnation of civilization and degradation of natural resources. So the decline in foreign trade followed by a decline in local trade certainly produced the deterioration in the agriculture and industry of Harar, to the extent of humiliating the workers and peasants. This fact shows how intervention affects the natural way of things and further shows us how far people can meet their needs, independently of their own resources, without external trade and free travel of people. Obviously economic development, to a certain level, brings with it additional needs. The material conditions determine the concioucesness. The higher the level of development the greater the need is (or vise versa). This must considered when such issues like the sustainable use of resources are dealt with all the issues boil down to satisfaction of peoples needs and the improvement of their living conditions. The Hararis have enjoyed centuries of prosperity and economic and social progress under their own sovereign government and had attained the highest status in human civilization comparative with other regions of Ethiopia before it fell a century ago, under the yoke of the far backward feudal rule headed by barbarous war lords of Shoa. It was after a series of battle and the defeat of the Harari people at the Chelenko battle field that the region's economic development took a reversal course. The Chelenko war has resulted in the humiliation and genocide of the people and halted the region's economic progress, and the stagnation of its civilization. The part played by the then European powers in supporting the feudal lords was a grave historical error committed against, not only Hararis, but against humanity, civilization and human achievement and the environment. The degradation of the human and natural resources, the distraction and misplacement of the peoples achievements and cultural heritage followed by a massive popular migration, backwardness and poverty that is witnessed today is the result of this intervention under the rule of the gun. According to the result of the recent population census (September 1994) the total population of Harari region is indicated to be 131,000 of which the percentage share of female and male is 50%. The residents of Harar town are estimated to be 76,798, while the rural residents number 54,761. There are 30,071 households in the Harari region with an average of 4.3 persons per household. The variables that determine population growth are fertility, mortality and migration. The fertility rate of the Harari region is 2. The growth rate is insignificant. The infant mortality rate is 113 deaths per year per 1000 birth. The census reveals that the rate of in-migration to the Harari regions in the 12 months prior to the census was 1.6 percent, where as the migration in the four years before the census constituted 7.8 percent of the region's population. The census further indicates that about 23% of the total population of the Harari region are migrants. From this census result it is evident that almost all of the migrants have settled in the town of Harar. Hence it is possible to conclude that 23 percent of the Harar town residents are in-migrants. According to this analysis, one can conclude that the in-migrants substantially contribute to the annual growth rate of the population of the Harari region. Thus, the implementation of the population policy in the region should consider the impact of this in-migration on the population dynamics of the Harari people so as to avoid distortion in planning conservatory participation. Copyright 2010 Amiir Nur. All rights reserved.